Harding High School in Bridgeport. The city’s schools hosted the state’s first mental health program to focus on trauma. Since the horrific shooting of children and faculty at Sandy Hook Elementary School in December 2012, Connecticut has made significant investments in school mental health services and specifically in identifying and treating victims of trauma. But with no state budget and school beginning in less than a month, many Connecticut districts may have to cut back on recently expanded mental health services or make room for them in their own budgets. Mental health services in schools have been shown to increase attendance, decrease dropout rates and improve academic performance, said Jesse White-Frese, the executive director of the Connecticut Association of School Based Health Centers. School-based health centers integrate medical and mental health care – often in schools with many low-income or high-risk students. The centers may provide weekly counseling or therapy, for instance, as well as physicals, asthma treatment or other routine care. Mental health care has represented a growing proportion of care in recent years. The centers have received widespread backing from policymakers in the past. In the 2013-2014 school year, the high point for state funding, the state budget allocated $12.46 million for school-based health centers, and 13 new sites were opened, bringing the total to 92, White-Frese said. The following year, the Department of Children and Families funded a pilot program in Bridgeport to address victims of trauma in particular. Called the Cognitive Behavioral Intervention for Trauma in Schools (CBITS) program, it screens students for mental illness and trauma and places those in need into a 10-week group-therapy program that meets during the school day. Since its inception, the program has grown to seven districts and expanded to incorporate elementary in addition to middle and high schools, with a state allocation of $194,000 in the last fiscal year, said Jason Lang, director of dissemination and implementation for the DCF contractor that runs the program, the Child Health and Development Institute. Problems include anxiety, depression and disruptive behavior, in and out of the classroom. It is unclear whether the trauma initiative will be able to continue, however. Without an adopted state budget, the state is being run under an executive order issued by Gov. Dannel P. Malloy. That order has cut funding to DCF, and the agency has not yet renewed the contract for the CBITS trauma program for the fiscal year that started July 1. Jason Lang presenting on trauma for the Child Health and Development Institute. The executive order also cuts funding for the school-based health centers by 25 percent. “When school starts up again, if a budget hasn’t been passed and there’s not funding that’s been released for CBITS, then there won’t be funding to support the schools or providers or to train new schools,” Vanderploeg said. While most school-based health centers will be able to remain open, three in Norwalk closed last year after funding was reduced. Staff hours at other sites will be cut, and some centers may close before the end of the school year, White-Frese said. The centers have seen marked increases in the percentage of mental health visits in recent years, including a jump from 30 to 41 percent of total visits between 2009 and 2014. In a state trying to close a deficit of at least $1.6 billion for this fiscal year, maintaining last year’s levels of funding for health and social services seems unlikely, said White-Frese. Stamford Public Schools, however, have insulated themselves from the cuts by funding school mental health programs on their own. 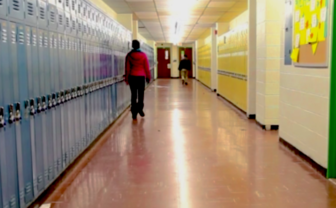 In 2014, after three consecutive teen suicides in the city, the school district decided to reorganize its budget to implement a behavioral intervention program on its own. “Out of these terrible events we really got support,” said Joe O’Callaghan, head of the Stamford public schools social work department. The Stamford schools formally assessed their mental health needs and developed a plan to address them. “We didn’t have good data on how many kids have a mental health problem. We didn’t have a systematic approach to how we were providing services. We didn’t have a focus in terms of leadership in this area,” O’Callaghan said. O’Callaghan said Stamford needed to embrace the idea that a school could provide not only academic learning, but mental health care as well. “The idea that a school district can be a place that can provide mental health services… requires a real culture shift,” O’Callaghan said. And that shift wasn’t easy. The first attempt at introducing CBITS was “a bit of a failure,” O’Callaghan said, because the the school’s social workers and psychologists hadn’t received the proper support. “We were asking people who did their own thing for a long time to do something very different — an evidenced-based model — and really focus their attention around the issues around trauma,” O’Callaghan said. It is difficult to get teachers and school administrators to stop focusing on a student’s behavior, and instead focus on the reasons for that behavior. “We are asking them to step back and look at this child and look at the triggers for why they’re doing this,” said Cecilia Singh, an assistant clinical professor at the Child Study Center at Yale School of Medicine. Before this initiative, children who were disruptive were given detention, suspended or even expelled. About 25 percent of children experience or witness trauma before they turn 4, according to the National Center for Mental Health Promotion and Youth Violence Prevention. And Stamford is no exception. Although it has taken a big investment from Stamford’s school board, their program’s survival or expansion does not hinge on the state’s budget. 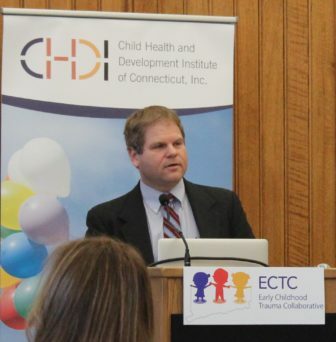 “Stamford is a good example of a district that said we are going to put some money together from our own district budget to get CBITS training in place and then later joined the DCF cohort of schools,” Vanderploeg said. Last year, Stamford received a grant from DCF just like the other schools that have adopted the CBITS program, including Bridgeport, New Haven, New London, Bristol, Enfield, Hartford and Norwalk. However, since they weren’t promised the grant for subsequent years, Stamford used the money for training and won’t need to diminish their program if state funding doesn’t continue. “In terms of sustainability, Stamford has done a very good job, and Joe has been very smart about identifying leaders to carry out the work,” Singh said. The social workers and school psychologists that are already trained in CBITS will be able to pass along their practices to future hires and continue the program without further funding.